Japan’s Onkyo is getting an early jump on the flurry of tablet announcements expected to lead up to January’s CES show in Las Vegas, announcing today it’ll be offering two tablets with 10.1-inch touchscreen displays powered by a 1 GHz Nvidia Tegra 250 processor. 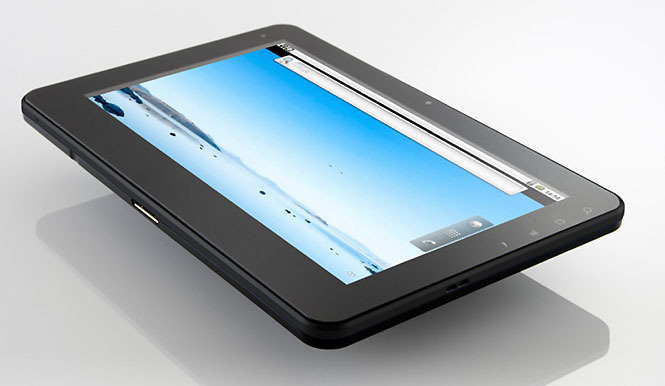 And there Onkyo’s previously announced Windows 7 “SlatePad” tablets were aimed at corporations, these new Android devices seem targeted at individual consumers. According to announcement (Japanese PDF) Onkyo is preparing two versions of an Android tablet under the model numbers TA117C3 and TA117C1: both devices will feature a 10.1-inch 1024 by 600-pixel widescreen touch display, 802.11b/g/n Wi-Fi and Bluetooth 2.1+EDR wireless networking, a microSD expansion slot, a front-facing 1.3 megapixel webcam, USB 2.0 connectivity, microSD removable storage and HDMI output for pushing video and photos to a convenient HDTV. Both tablets will be powered by a 1 GHz Nvidia Tegra 250 processor—which ought to give them more graphical oomph than their competition. The main distinctions between the two models will be storage and RAM: the TA11C1 will sport 512 MB of RAM and 8 GB of flash storage, while the TA11C3 doubles those numbers to 1 GB of RAM and 16 GB of flash storage. Unfortunately, Onkyo has not revealed any pricing or availability information for the new tablets—we’ll just have to see if they emerge from the Japanese market in due course—but the announcement does indicate Onkyo’s willingness to play on both sides of the fence in the upcoming not-an-iPad tablet wars between Windows-based devices and Google’s Android juggernaut.